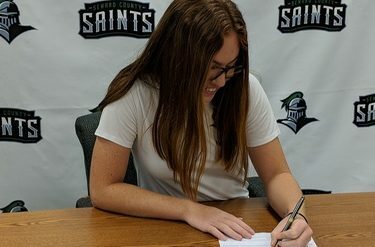 Seward County’s Martina Borges signed her letter of intent on Tuesday in the All-American Room, finalizing her commitment to NAIA Indiana Tech. Borges, a 2017 All-Region VI Champion, secured the number five singles slot on this season’s No. 6 Seward County team, winning seven matches in the spring. She added six more wins in doubles action, playing two matches at the number two slot, while being part of the regular number three slot. She came up just short of back-to-back Region VI Championships, falling in the championship round her sophomore year. After winning the Region VI Championship in 2017, Borges was named as the ITA Region III Player to Watch for the NJCAA National Tournament, where she fought to a third-place finish in the number five bracket. The Venezuelan will be heading to Fort Wayne, Indiana to join third year Head Coach Brandt Danals’ Warriors squad that has produced eight all-conference selections during his tenure.